At Applications Engineering we offer a selection of stainless steel and alloy vertical level switches, carefully chosen for their durability and safety. 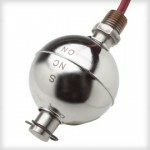 These are designed to be mounted to the top or bottom of a tank, and come with leads of various lengths to ensure that a high- or low-level signal can be triggered in a chamber of any size. As with all of our switches and valves, our vertical stainless steel and alloy level switches are performance tested to ensure that our clients always receive high-quality components at a cost-effective price. If you are unable to find the level switch you are looking for, please contact us and one of our experienced technicians will be happy to help.